GM Paragua Wins 2013 PSC Cup; Pascua and Gomez shares second. 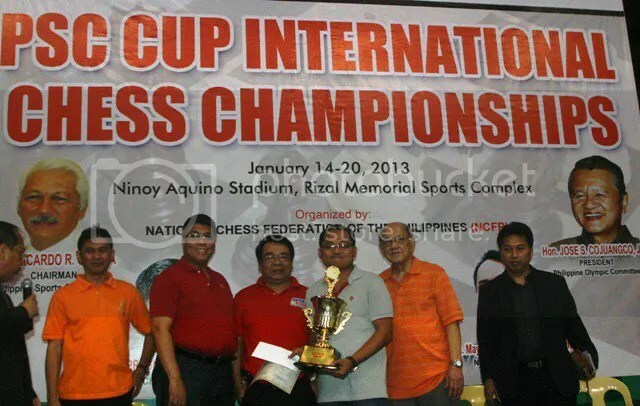 Grandmaster Mark Paragua, as a follow up to his 2012 Philippines National Chess Championship trophy, won the 2013 Philippine Sports Commission (PSC) Cup International Chess Championship, a clear first place finish, held 14-20 January at the Ninoy Aquino Stadium, Rizal Memorial Sports Complex, Manila. Read more: GM Paragua Wins 2013 PSC Cup; Pascua and Gomez shares second.